Kricketot in game: 1,709 Who? Important notice! Pokemon Kricketot is a fictional character of humans. Kricketot (Japanese: ???—? 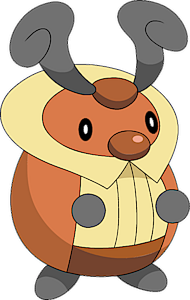 Koroboshi) is a Bug-type Pokémon introduced in Generation IV. 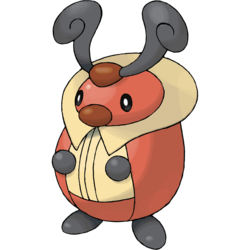 Kricketot is a bipedal, bug-like Pokémon. The majority of its body is red with a streak down its front and black cape-like marking on its back. Its head is encircled with a flat, white structure similar to a collar. A female has a bigger collar than a male. Two hard, black antennae with curled tips are connected to the head by a dark red segment. A similar dark red segment forms this Pokémon's nose, and it has small, black hands and feet. By shaking its head and rubbing its antennae together, it is able to compose a xylophonic sound that it uses to communicate. Kricketot's first significant appearance in the anime came in Last Call — First Round!, where one was used by Nando during the Performance Stage of the Sinnoh Grand Festival. It performed along with an Altaria and helped Nando advance to the Contest Battles. 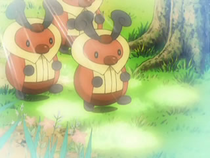 Kricketot has appeared fairly often in the anime, however these are mostly fleeting cameos. Kricketot made its anime debut in Dawn Of A New Era!, and later made appearances in A Trainer and Child Reunion!, The Lonely Snover!, and Battling a Cute Drama!. Two Kricketot were seen under Reggie's care in Lost Leader Strategy!. It reappeared in Saving the World from Ruins!. Several Kricketot also appear in The Rise of Darkrai, playing in the garden amongst the other Pokémon. A Kricketot made a brief cameo in SS024, outside Professor Rowan's lab. A Kricketot appeared as a mask for the festival in Capacia Island UFO!. Platinum was attacked by a swarm of Kricketot and Kricketune. A Kricketot cameoed in Crafty Carnivine. Kricketot debuted in The Mystery Boy, Jun!! 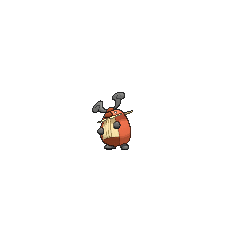 Kricketot is less common in the wild than its evolved form, Kricketune: it cannot be found during the day, while Kricketune can. Kricketot is based on a cricket and a music conductor. Kricketot is a combination of cricket and tot. Koroboshi may be derived from kuroboshi tsutsuhamushi (the black-spotted leaf beetle) or a combination of ?? koorogi (cricket) and ?? kuroboshi (black-spot). Mandarin Chinese ??? Yuán Fa Shi Literally "Round master". ?? may be derived from ?????? tsukutsuku-boshi.